PTS 2000 sets a new standard for full-featured projection perimeters. This is where the ergonomic design meets the requirements of modern visual field evaluation. Performing everything from a quick screening test to manually controlled kinetic perimetry is simpler than ever before. PTS 2000 brings to you one of the world’s largest field testing ranges and options, together with all Goldman stimuli sizes and stimuli colors used in perimetry. With the modern and intuitive software, all that is available at your fingertips. 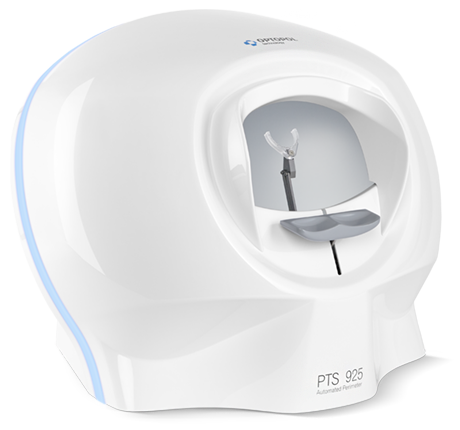 The PTS automated perimeter series are modern diagnostic instruments for precise and fast testing of visual fields. Beside standard perimetry testing techniques they implement all of the latest visual field testing approaches saving time and deliver cutting edge precision and reliability. Intuitive software with powerful networking and EMR integration, combined with maintenance free and reliable hardware creates the best tools for visual field testing. Complete set of standard perimetry tests. Variety of threshold algorithms and screening techniques. Binocular Driver’s Test, Flicker perimetry and Blue on Yellow. Complete palette of analysis tools for quick and thorough assessment of visual fields. Comparison and progression module available in standard package. Kinetic testing for quick evaluation of peripheral field loss. Standard test reports and global indicies. Automatic and manual kinetic perimetry. 180° horizontal and 130° vertical testing range for peripheral screening. Aspherical bowl for compact dimensions. All Goldmann stimuli sizes and colors used in perimetry. 30-2, 24-2 and 10-2 testing fields. Advanced Threshold strategy – quicker examination without loss in result resolution. 24-2/24A field tested in less than 3 minutes (30-2/30A in less than 4 minutes)*. Provides more detailed information than screening strategies in comparable duration. High resolution camera for precise monitoring of patients’ compliance. Blink control – no stimuli are omitted due to normal blinking, test is put on hold until the eye is opened again. Eye tracking – analyses pupil movement and assures supreme reliability of test results. Voice messages assist operator and patient during the examination. Rich library of predefined test fields and programs. Custom test settings can be stored and accessed with a single touch. Follow-up tests can be performed by simple selection of base examination. Partial test results of not completed test can be continued at a later date. Built-in networking features – data can be accessed from anywhere within your network. Out of the box DICOM support. Storing visual field reports on the DICOM image server. GDT interface and custom EMR’s based on text file interface. Fast and precise perimetry at your fingertips. Automated Perimeter PTS 920 is a modern diagnostic instrument for precise and fast testing of field of vision. Beside standard perimetry testing techniques it implements all modern approaches which save time and deliver cutting edge precision and reliability. Intuitive software with powerful networking and EMR integration, combined with maintenance free and reliable hardware creates the best tool for visual field testing. 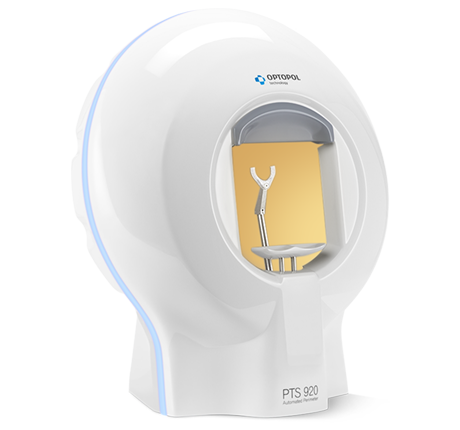 PTS 925W brings the world’s most popular orthogonal fields 30-2 and 24-2 into the compact sized device. Despite its compact size, the 925W offers cutting-edge design and software capabilities. 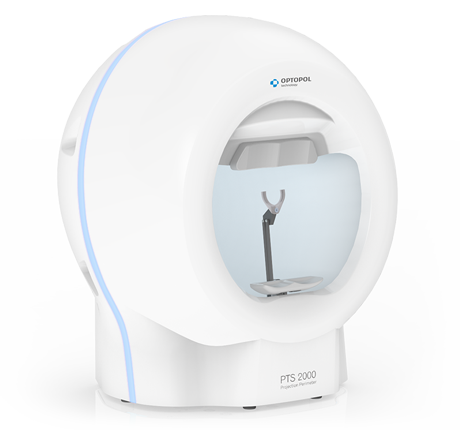 With the 170° horizontal and 95° vertical testing range (with fixation shifts), there is no scenario in which the PTS 925W could not play a role in glaucoma and other disease management. From precise macula thresholding to the binocular Esterman driving test – everything is within reach.